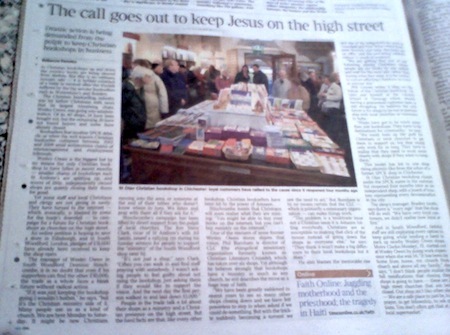 Today I’d like to offer my thanks to Rebecca Paveley for her superb write-up in Saturday’s Times outlining both the crisis facing and the future hope for the UK’s Christian bookshops: The call goes out to keep Jesus on the High Street. In Christian bookshops up and down the country books are being cleared from shelves. But this is no ordinary January sale — it is further evidence of a trade in turmoil after the travails suffered by the big secular booksellers such as Waterstone’s and Borders. The Christian bookselling industry was hit before Christmas with news that its largest remaining chain, Wesley Owen, was going into administration. Of its 40 shops, 14 have been bought out, but the remaining 26 have not found buyers and some have already closed. Booksellers fear another SPCK debacle, as when the well-known Christian bookseller collapsed between 2007 and 2009 amid acrimonious claims of mismanagement and employment tribunals. Wesley Owen is the biggest but by no means the only Christian bookshop to have fallen in recent months — smaller chains of bookshops such St Andrew’s are splitting up, and scores of little, independently owned shops are quietly closing their doors for good. Yet some staff and local Christians and clergy are not giving in easily. They have turned to the internet — which, ironically, is blamed by some for the trade’s downfall — to campaign for a future for Christian bookshops as churches on the high street. The piece has already prompted some discussion on facebook after Eddie Olliffe posted a link, with questions about what and who Christian bookshops are for and what we should be stocking: are we here to serve local churches as resource centres? Or are we there to bridge the gap between church and community, community hubs providing a space where people can explore questions of faith and spirituality without feeling like they’ve wandered onto another planet? Bookshops are not churches and I for one am not arguing for them to become churches. But can they be church outside of church: part of the Christian community that extends beyond the church buildings, Sunday services and house groups? And what about our range of stock? Should we be focusing on books? Or should we be thinking more about being Christian retailers, majoring on cards, gifts, music and other items? Can we do both? How do we get the balance right? Can a bookshop without a café survive let alone thrive in the 21st Century? My view — as summarised in the article — is that churches and bookshops need to work together. One of the reasons, I suspect, that some branches of Wesley Owen haven’t seen the support of local churches that others such as South Woodford and Walsall are receiving is that that rapport has never been there: the bookshops were stocked largely by decree of the former IBS-STL empire with its global ambitions and scaleouts driven by USA influences that mostly ignored local interest (please note that this is in no way a criticism of shop staff, who have undoubtedly always done their best at a local level). The challenge for all of us, it seems to me, is to think global but act local. Biblica were right in what they affirmed: it’s a global marketplace and we need to come to terms with that; but they were wrong in what they denied: at street level, where bookshops operate, it’s a local marketplace and we need to serve our local communities. Shops that attempt to impose their own agendas upon their customers will inevitably either drive them away or be doomed to watch them drift away; but shops that work with their customers will become places that people want to come to — and if we get it right, places they want to bring their friends to. I have to say this to me seems like a form of Ghetto-ism because all were doing is hiding the books in the churches and what about the unchurched, or even the churched but ‘not our type of christian’ who would be rather unlikely to want to visit the shop if housed in the xyz church or centre? Seems to be we want to be out of the churches reaching to all comers and that those in the churches should be moving to be supportive – if the only outreach is in our house then it’s not much outreach, and if I’m only going to support it because it’s in my church and convenient to me on that level what kind of ethos is that> questions we all need to be asking ourselves – and not just in regards to christian bookshps but in regards to what it means to be christian, to be a servant, to be true community instead of just a commune. Personally I think we should be looking to stay in the marketplace where everyone regardless of race, creed or culture can find us and feel welcome! so I think we should consider seriously looking instead at moving away from the model of pure christian bookshop and move into broadening the appeal of the shops, more product that is not christian, general books, gifts etc that appeal to the wider community and encourage them in. let’s make our bookshops/retail outlets community places not just christian places. Perhaps then we’ll really see a growth and outreach beyond what we have, more people coming in and meeting the idea of christianity in a way that does’nt stereotype, that doesn’t preach and that doesn’t close the door before they step over the threshold. But in a way that does say, here it is, it’s real, it’s me, it’s you – it’s here and you know what it’s probably not what you think – but it might well be what you need! Please advise me on how we at our bookshop can strengthen our relationship with our local church, staff members, school, pastors, & wife’s. We are a good bookshop but strife to thrive.